Launched on 1st April 1996 the Canon EF 135mm f/2L prime lens was certainly no April Fool’s joke and has stood the test of time. 135mm is a good focal length for portraits when attached to full-frame Canon DSLRs like the EOS 5D MKII. Also compatible with APS-C cameras like the EOS 7D however the increased 216mm focal length makes it attractive for sports or wildlife photography too – as long as you don’t need the flexibility of a zoom of course. The maximum f/2 aperture makes it a good option for fast shutter speeds in low-light and what’s more, artistic types will appreciate the creative shallow depth-of-field and attractive Bokeh effects possible with such a wide aperture. So does an oldie like the Canon EF 135mm f/2L still deliver the goods in the 21st century? Does it have anything to fear from the new breed of telephoto primes or an even older telephoto prime the EF 135mm f/2.8 Soft Focus? Read on to find out. Achieving a DxOMark Score of 26 overall the Canon EF 135mm f/2L USM ranks reasonably highly on the DxOMark ratings for Canon compatible telephoto prime lenses. As you would hope for a prime the individual Lens Metric Scores indicate it’s a bright lens with a Transmission score of 2.3Tstop and there’s very little Distortion or Chromatic Aberration noticeable as illustrated by Lens Metric Scores of 0.1% and 4um respectively. That said it only ranks 74th for all lenses tested on the DxOMark database and it’s not the best performing telephoto prime we’ve seen for Canon DSLRS either. The DxOMark Scores for telephoto primes tested on the Canon EOS 1Ds Mark III confirm the Canon EF 135mm f/2L USM ranks 5th overall behind competition from Sigma, Carl Zeiss, Samyang as well as Canon’s own EF 100mm f/2 USM. With an overall Lens Metric Score for Sharpness of 14 P-Mpix the Canon EF 135 f/2L USM ranks mid-table for a prime tested on the Canon EOS 5D Mark II and its sharpness is comparable to the Canon EF 100mm f/2 USM Score of 14 P-Mpix. Putting that into context further the Canon EF 135mm f/2L is a long way off the Sigma 85mm f/1.4 EX DG HSM, which achieves 17 P-Mpix for sharpness, but it does significantly out trump the Tamron SP AF180mm F/3.5 Di LD (IF) MACRO 1:1 Canon that only manages 9 P-Mpix. Delivering best sharpness at apertures between f/2.8 and f/8 by the time you close down to f/11 sharpness does tail off slightly and although still reasonable at f/16 shooting with very small apertures like f/22 & f/36 are to be avoided. Sharpness at f/2 is not brilliant either but this is to be expected at such a wide aperture and simply closing down 1-stop to f/2.8 will improve things considerably. If you’re buying this lens for creative shallow depth of field effects using f/2 then vignetting is an issue you should be aware of. It is optically very difficult to control edge shading at such wide apertures and the Canon EF 135mm f/2L USM is no exception with -1.33EV of shading at f/2. Close down to f/4 however and the problem is removed completely and doesn’t resurface at small apertures like f/32 either. The Canon 135mm f/2.8 Soft Focus lens (1987) is even older than the 1996 f/2L USM version. It only stops down to f/2.8 not f/2 and its Soft Focus filter is less relevant in the age of Photoshop, but the filter is optional and it’s possible to use the Canon 135mm f/2.8 Soft Focus as a standard lens, too. 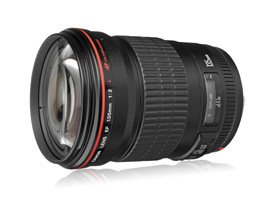 So, when we’re all looking to save some cash, how good an alternative is this older lens to the EF 135mm f/2L version? Well it’s immediately clear that the more expensive f/2 version out performs its older rival in every department. The DxOMark Lens Metric Scores show that it’s sharper, 14P-Mpix to 11P-M-pix, brighter by 0.8Tstop with less Distortion, Chromatic Aberration and Vignetting. In terms of sharpness the f/2L version is actually sharper at f/2 than the Soft Focus version is at f/2.8. Stop down the aperture on the Canon EF 135mm f/2L to f/2.8 and it also delivers better sharpness across the entire frame without the edge softness evident on the 135mm f/2.8 Soft Focus lens. In fact you need to stop down to f/5.6 on the EF 135mm f/2.8 Soft Focus until you get something approaching edge to edge sharpness, which is not great for a prime lens. As already mentioned controlling lens shading at f/2 is optically difficult and some heavy shading requiring postproduction correction is inevitable on the EF 135 f/2L. Stop down to f/2.8 however and vignetting is much better controlled on the newer optic compared to its older counterpart, and shooting at apertures of f/4 or smaller with either lens the problem is eradicated. Canon 135mm f/2L USM: A solid performer and a good deal second hand? 16 years on from its launch the 135mm f/2L USM is still a solid option for portrait, sport and low-light photography. That said as lens development continues to evolve recent telephoto primes like the Sigma 85mm f/1.4 EX DG HSM and Canon 300mm f/2.8L IS II USM do demonstrate notable improvements in Sharpness. Although performing well in all our DxOMark Lens Metric Scores the Canon EF 135mm f/2L USM only ranks 5th for EF mount telephoto primes on the EOS 5D Mark II and new in terms of quality to price ratio the Sigma 85mm f/1.4 EX DG HSM is noticeably sharper and a couple of hundred pounds cheaper. If you can pick up a Canon EF 135mm f/2L for a good price second-hand however then this very capable telephoto prime lens could be a bit of a bargain. Ranking sharpness vs. age the trend in the main demonstrates newer telephoto primes have the edge but buying the 135mm f/2L USM second-hand could be a bargain for a very capable lens.